Avril Lavigne is set to release her collaboration with super fan Nick Minaj, 'Dumb Blonde', on Tuesday (12.02.19). 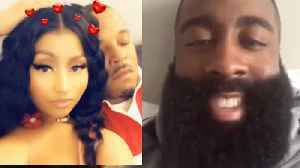 Khloe Kardashian’s Ex James Harden TEASES NEW Meek Mill Nicki Minaj Diss Track! Khloe Kardashian’s ex James Harden listening to a NOT YET released song from Meek Mill where just about EVERYONE thinks he’s coming for his ex Nicki Minaj and her new man. PLUS…if you were hoping..